Country: JAPAN Catalog No: UICY - 78501. Release Date: November 17, 2017 (Pre-order). 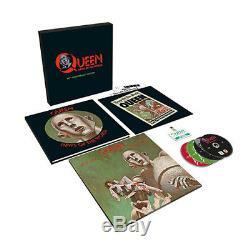 Super deluxe edition of "News Of The World" from Queen consists of 3 SHM-CDs, a DVD, and a LP. Disc 1 (original album) includes "All Dead, All Dead" featuring Freddie Mercury on vocal. Disc 2 (raw sessions) consists of alternate takes, demo ones, and rough mix versions, including "We Are The Champions" with entirely different rendition and vocal from the previous recordings. Disc 3 includes 19 rare tracks, featuring live, BBC session, and instrumental. The DVD is a documentary "Queen: The American Dream" featuring never-before-seen footage from the band's 1977 U. Tour, both onstage and backstage. Comes with a 60-page hardcover booklet, press kit, three posters, a sticker sheet, a re-production of the backstage pass of 1977 tour, and more. Comes with lyrics and a description. The item "QUEEN, NEWS OF THE WORLD, SUPER DELUXE EDITION, 3CD+DVD+LP, JAPAN, 2017" is in sale since Sunday, October 08, 2017. This item is in the category "Music\CDs". The seller is "kuplinovsergey" and is located in TOKYO. This item can be shipped worldwide.